How can you accurately predict future revenues? How can you get more insight into your deals and your sales pipeline? Before we delve into deal stages, let’s briefly explain what’s a deal and a pipeline in the CRM context. A deal is an opportunity to increase revenues, but not only. Deals can help you get a clear idea of where your team is in the sales process, and the steps they need to take in order to close them. Deals are an integral part of the CRM, because they generate revenue for your company. They are the very heart of the sales process. But what about the sales pipeline? In the CRM context, a pipeline is an accurate visual representation of your sales cycle. Each pipeline has stages that are unique, depending on how the sales team actually operates. With the concepts of deals and pipeline explained, let’s now explore deal stages and the WON probability. How can you understand them? What purpose do they serve? What is the WON probability and why is it important for your organization? Each company has its own sales cycles, its sales philosophy. 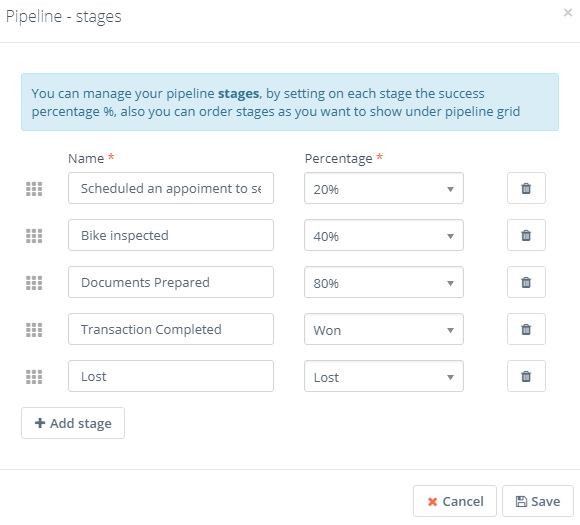 To understand deal stages in Flexie CRM, let’s say you’re in the business of selling bikes. You’ve identified a sales opportunity, which in Flexie CRM is called a deal. You want to know where the deal stands and what is the probability of that deal being won. The first step is to build a sales pipeline. 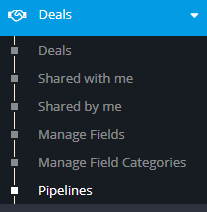 Go to Deals and on the drop-down menu click Pipelines. Let’s say you have created the deal and now you want to manage each stage. How do you do that? Once again, go and click the Pipelines button. Next, click the Manage Stages button. Here you can set the stages for the pipeline you’ve created. Notice that each stage has a success percentage attached to it. But why do success percentages matter? They are at the very heart of sales forecasting. Success percentages on each stage give you an idea of the expected revenue in a certain pipeline. For example, $5000 at 80 percent probability is more valuable than that same exact amount at 20 percent. Why? Because a deal with 80 percent probability is more likely to close. In Flexie CRM, you can create your own deal stages. Let’s say you have created a pipeline with the name Mountain bike sale. Next, you proceed to create your own stages: Scheduled an appointment to see the mountain bike(20 %), bike inspected (40 %), documents prepared (80 %) and then Transaction Completed. Remember, a deal is either WON or LOST. In our case, we want to explain the WON probability. The first deal stage, scheduling an appointment to see the bike (20 %), could be seen as the initial stage in the sales cycle. Your sales rep has scheduled an appointment with someone who wants to see bike. Let’s suppose that person inspects the bike. You move the deal from the first stage to the second, bike inspected (40%). The potential buyer likes the bike and documents are prepared (80 %). Next, transaction is complete (90 %). The deal is close to being won. If everything goes as predicted, the deal will be WON. As you can see, each stage has a success percentage. Bear in mind that different products have different sales cycles, hence deal stages will be customized to match the sales cycle of each and every product. In Flexie CRM, you can easily move between deal stages by a simple drag and drop. The WON probability helps you in sales forecasting. The more your success percentages reflect the actual likelihood of a certain deal being closed, the more accurate your sales forecasting will be.